The Argo II have made progress on many quests but they are no where near defeating the earth mother, Gaia. Her giants have all risen and they are stronger than ever. The demigods must face Gaia before the Feast of Spes, where she plans to have two demigods sacrificed to Athens. Gaia needs their blood to awake. The Roman legion from Camp Jupiter,led by Octavian, is ready to strike Camp Half Blood. The gods are still suffering from multiple personality disorder, so they are useless. It up to the young demigods to stop Gaia from rising. If Gaia rises, then its game over. This book is full of adventure and near death experiences by many of the crew members. The Blood of Olympus keeps you on the edge of the seats, and there are also moments where things are sad. I think the Blood of Olympus is a really good book and a great finish to the series. I really loved of Rick added Reyna’s and Nico’s points of view because we get to know more about them. However, I would have loved if Rick added more Percy and Annabeth’s point of view. I also think the ending could have been better. My friend in 6th grade recommended me the Percy Jackson and I was hooked from that moment on. I loved how Rick mixed modern day time and Mythology. I kept reading it because the book was crazy and funny. The book is adventure so you want to know where they are going and who dies. I would recommend this book to anybody who likes mythology and loves adventure books. 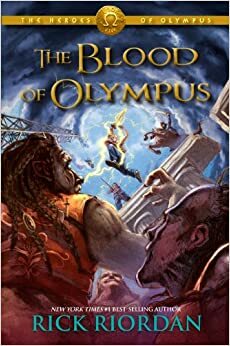 This book series is seriously amazing, but I recommend you to read Percy Jackson and Olympians series first before reading The Heroes of Olympus. Because some things the chracters say in the Heroes of Olympus you might not understand.